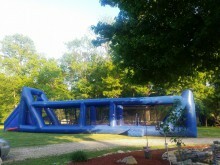 Amusement Supply Company is happy to list this 2 pcs Inflatable Zip Line. This unit requires 2 2HP Blowers. This unit is approximately 85’ long. This unit comes with the harness basket and the cable. This unit is located in Prospect KY at the Amusement Supply Company warehouse. For more information contact Geoff Schutz at 502-228-4595 or email geoff@getzulu.com . I would be interested in trading on this unit as well. 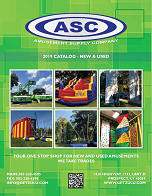 Click the button below to add the Inflatable Zip line to your wish list.